The Australian Labor Party’s worst election result in New South Wales in more than a century can’t simply be written off as an enraged electorate taking its revenge on a corrupt and incompetent government. It’s also the writing on the wall for federal Labor as its traditional support base of aspirational blue and white collar workers and pinot-swilling social progressives abandons it to find political solace elsewhere. Some on the left are going to the Greens but the great majority are turning right, straight into the arms of the Liberals and Nationals. Labor always feared decimation in New South Wales after a wave of ministerial scandals and gross mismanagement of the state’s shrinking resources. Yet the scale of the defeat is even worse than anticipated, with the Liberals astonished by the extent of their gains – a primary vote double that of Labor. In seat after seat, the Coalition didn’t need to go to preferences to win while in seat after seat, Green candidates outpolled Labor in the primary vote. This is the nightmare paradigm Labor now faces across the board. Even the ALP’s staunchest supporters wonder if this spells the end of the party as a mainstream political force. It’s not just the loss of a slew of once solidly Labor seats. It’s the fact that Australia’s most populous state, and by extension much of the country as a whole, has turned its back on Brand Labor, repelled that the idealism of Chifley’s “light on the hill” has been snuffed out by political thuggery and back-room factionalism. 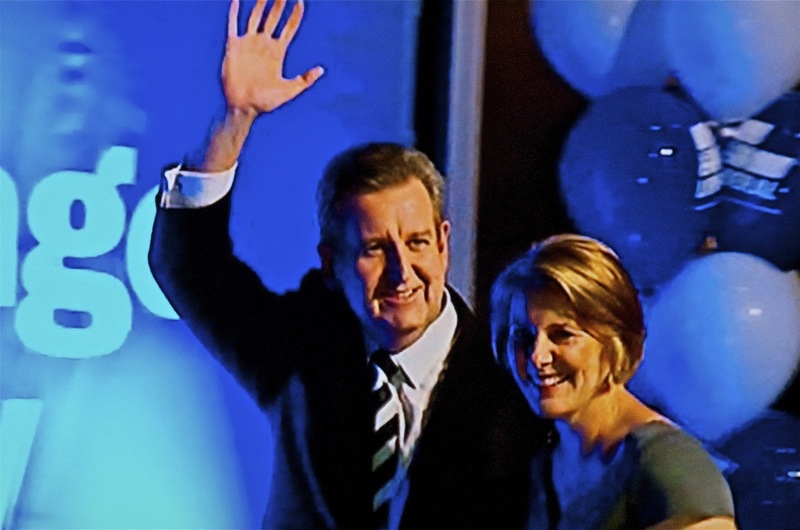 There was a gadarene rush towards the brand of reassuring, competent conservatism embodied by Liberal leader Barry O’Farrell ( pictured). With an unprecedented 17 per cent swing, the Coalition is set to win about 70 lower house seats, Labor 20 and independents the remaining three. Labor apparatchiks delude themselves into thinking that voter intentions in state and federal elections are resolutely separate. Yet as she watched the results come in, Prime Minister Julia Gillard would have been sick to the stomach as the full extent of the disaster unfolded. It was outlined succinctly by her left faction colleague, NSW MP Luke Foley, whose role as truth teller on the ABC’s election coverage was truly heroic. “Labor has lost its heartland” – he solemnly declared – as once rock-solid seats like Parramatta, Smithfield and Campbelltown fell like dominos and proud working class bastions around the industrial nerve centres of Newcastle and Wollongong drowned in a sea of conservative blue. “All we have left are a few sticks of furniture, Foley said. Oh, and a likely new opposition leader in John Robertson who epitomises the Tammany Hall culture that’s steadily destroying the party from within. Don’t take our word for it. It was ALP hero Paul Keating who famously said that the day Robertson becomes leader is the day Labor is finished. That prophecy is about to be fulfilled. In this election, the New South Wales electorate hasn’t so much decided to flirt with the right or even clutch it in temporary embrace. The extent of the swing – especially in Labor’s (former) heartland -looks more like a declaration to move in. Lock, stock and O’Farrell. Once derided by Labor as “Fatty O’Barrel” before he slimmed down and turned seducer, BOF is safe for at least two elections and maybe more. So does anyone seriously think what happened this weekend has no ramifications in the federal sphere? Was that a pig that just passed overhead? Yes, New South Wales voters want O’Farrell to do a Mussolini and make the trains run on time. But ominously for Gillard, they also seem to have accepted Bazza’s plea to turn the NSW poll into a plebiscite on the federal government’s carbon tax. How else to explain the huge swing to the Liberals in the former Labor industrial strongholds of the Hunter and Illawara, where a carbon tax would really bite? Voters are worried about cost of living pressures and especially electricity prices. And there’s plenty of evidence that they simply don’t buy the notion of Australians taxing carbon emissions if the Americans, the Chinese and others won’t do the same. It’s a fair bet that this is why the Greens didn’t do as well as expected in this election. The Greens assault on deputy premier Carmel Tebbutt in Marrickville was a total fizzer, with a loopy candidate who’s been trying to get the local council to declare war on Israel. And it remains to be seen, as postal votes are counted, if they can unseat education minister Verity Firth in Balmain with a candidate who used to peddle Horny Goat Weed for a living. Are Australian voters finally waking up to the fact that far from being cuddly advocates for mother earth, the Greens are dangerous zealots who pose a direct threat to their living standards? It sure seems that way. There was also a stampede away from most of the independents, and especially in two state seats – Port Macquarie and Tamworth – whose independent federal members prop up the Gillard Government. The Nationals won both seats, something that would have sent shivers up the spines of Rob Oakeshott and Tony Windsor. It’s the writing on the wall for both of them that neither will survive the next federal election. Their conservative constituents are just waiting to whack them for giving Australia Julia Gillard. All of which means they can choose to bring her down now and perhaps be forgiven or continue to prop her up and face certain political death. No wonder Tony Abbott’s grin at the Liberal victory party was as wide as Barry O’Farrell’s. May you live in interesting times, goes the old Confucian proverb. Too right. Your main premise that the NSW election has seen voters flee to the conservatives is only correct in the case of the state poll. Where's the evidence that voters feel the same about the Gillard Government? A couple of Newspolls ago, support for Gillard had collapsed immediately after her backflip on the carbon tax. But the last Newspoll had her bouncing back and strongly preferred over Abbott as PM. So, yes, the mums and dads of middle Australia abandoned Labor in NSW. But they're keeping the faith with Gillard. Doesn't this prove that voting intentions when it comes to state and federal are always different? Wrong again, Grubs.